Let me first warn you that many of the people that claim they have sciatica, actually do not. 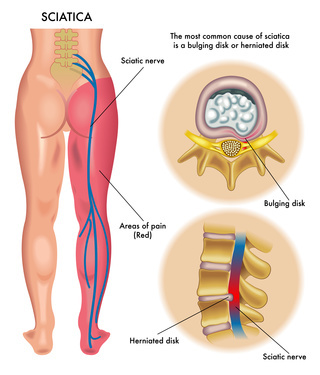 True sciatica means that the sciatic nerve is being irritated somewhere along its path. You will hear many people with low back pain saying that they have sciatica, when really they could have a number of other things going on without any real irritation to the sciatic nerve. Please realize that the term "sciatica" is used to describe the symptoms one experiences when the sciatic nerve is irritated. The symptoms include - sharp electrical pain down the back of the leg (often clear into the foot), numbness, weakness, tingling, or lack of motor control in your leg. Because you have a sciatic nerve on each side of your body, you are likely to only experience these symptoms on one side. If you are having symptoms on both sides, a more thorough examination for central canal stenosis, or other serious conditions, should be performed. Since we know sciatica describes your symptoms, the next logical question becomes - "what is causing this irritation to the sciatic nerve?" There are many sources for this insult to the nerve and its roots. Here are a few of the possibilities - disc bulge, disc herniation, lateral canal stenosis, degenerative disc disease, chemical inflammation from the surrounding joints and muscles, myofascial entrapment, or a hypertonic muscle that is compressing the nerve. It is this last issue of hypertonic musculature that I would like to expand upon. Between 10 to 15% of the population have an anomaly of the sciatic nerve where it courses through or splits over the piriformis muscle in your gluteal region. Trigger points, hypertonicity, or inflammation of the piriformis muscle in these individuals can lead to symptoms of sciatica. The bottom line for you as a patient is that the only way for you to get relief from your sciatica is to have a thorough examination that determines the cause of this irritation. 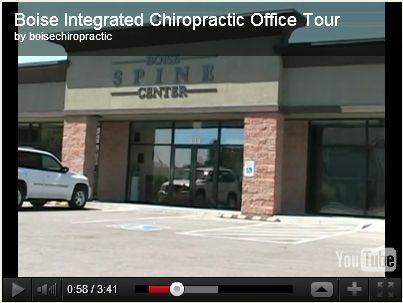 Chiropractic, combined with physical rehab, have been shown to benefit patients with sciatica. Many of our patients benefit from muscle work, nerve flossing, physiotherapy, and chiropractic adjustments.